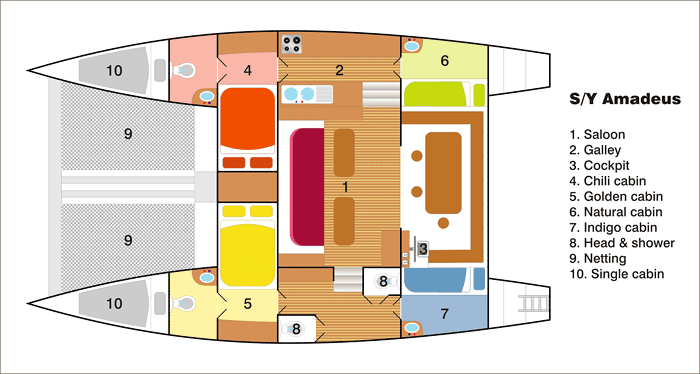 SY Amadeus is a 48 ft aluminium fast sailing, fully crewed catamaran for up to 8 overnight guests. 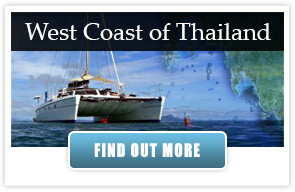 Sailing Thailand, Malaysia and Myanmar (Burma). 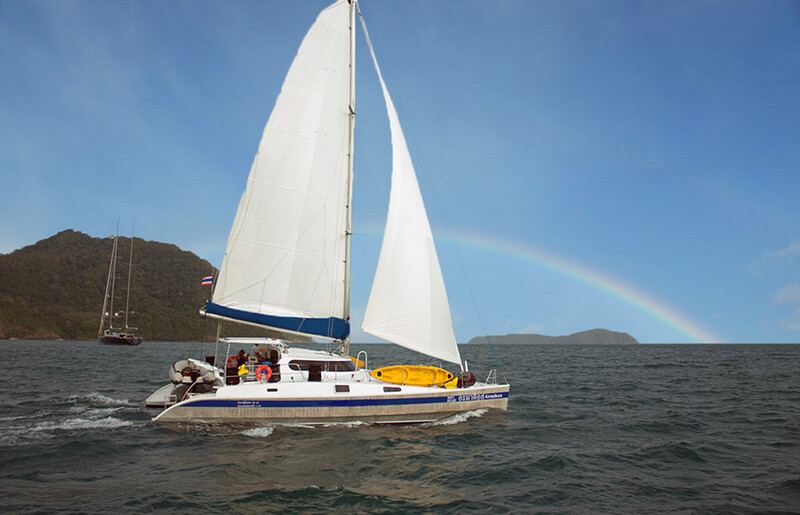 This fast sailing yacht is your choice for a relaxed cruising holiday, gourmet cuisine and fun activities in and out of the water. 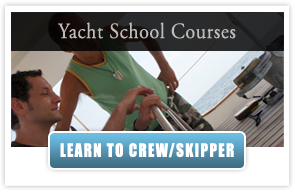 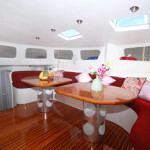 Whether you embark on a day trip or on a longer sailing cruise, you will have a great time on board of this yacht. 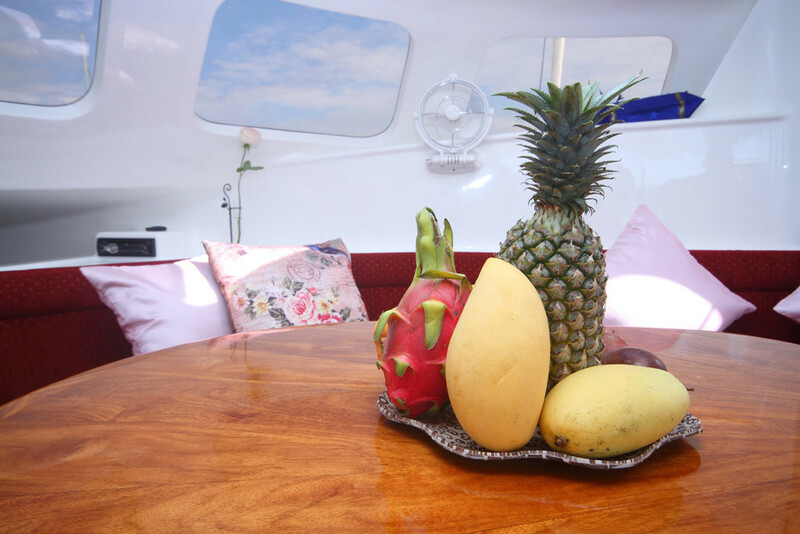 The owner, a former chef, runs the yacht like a floating restaurant. 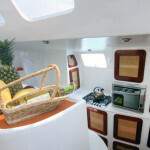 Delicious Thai and European dishes keep appearing from the galley. 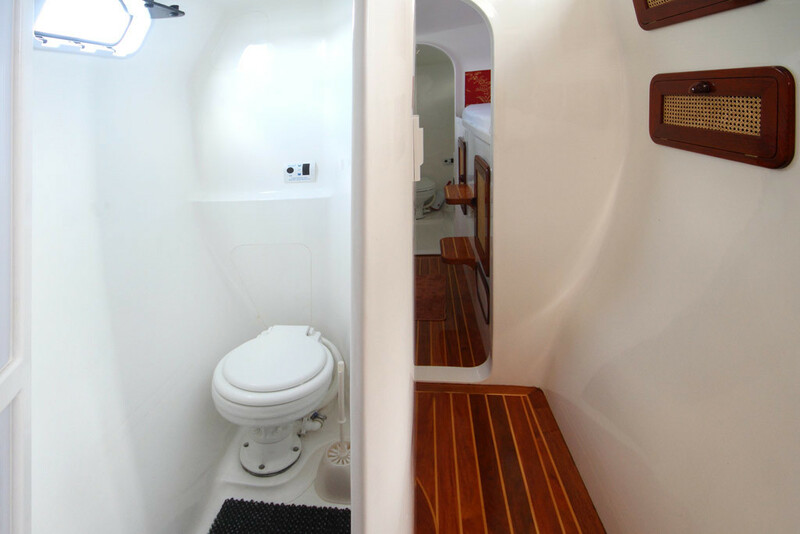 Fresh water usage is no issue with the large capacity water maker. 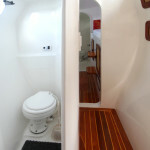 Cabins are well ventilated with opening hatches and electric fans. 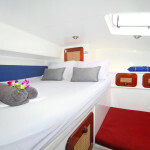 Or … you can sleep under the stars: the 30 sqm of netting is probably the largest bed you’ve ever slept in! 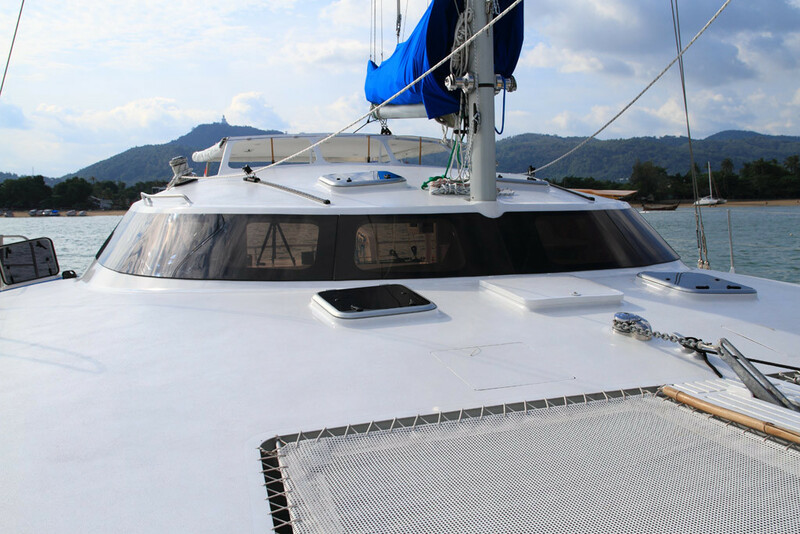 At the end of a great sailing day: lie down in the netting, sip your gin-tonic, watch the sun go down and enjoy the soft tones of “Eine Kleine Nachtmusik”! 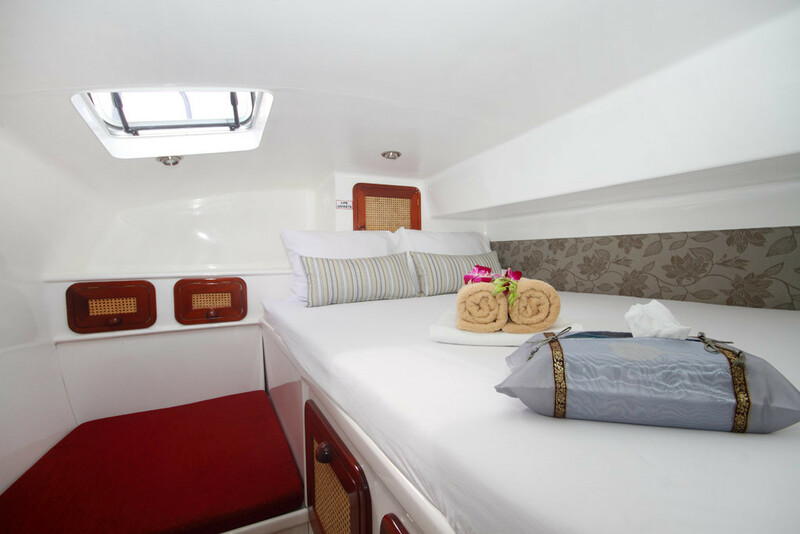 Below Decks You will immediately feel at home on this yacht. 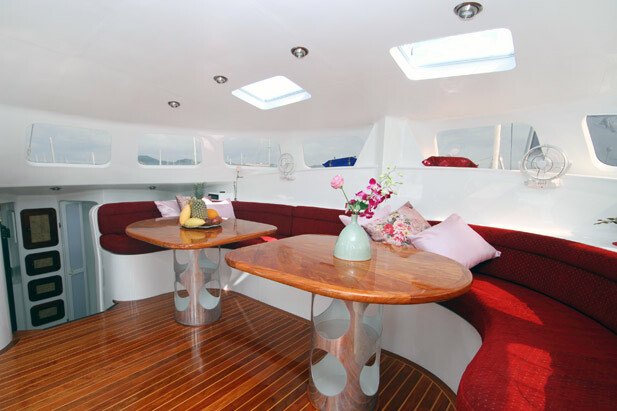 Amadeus’ interior is stylishly designed in natural wood colors contrasting with light tinted interior elements. 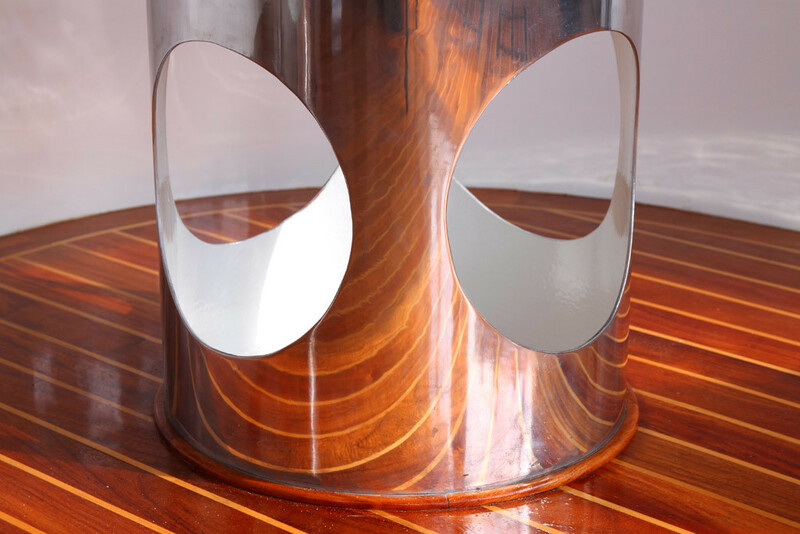 The rosewood / beach parquet floor is a masterpiece of craftsmanship, harmonizing beautifully with the custom built furniture. 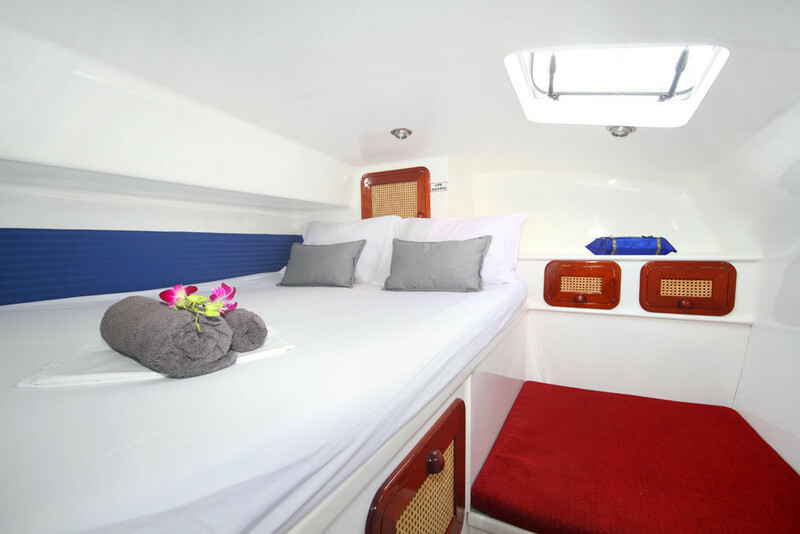 Accommodation on this sailing catamaran is in three en-suite double cabins (own bathroom and shower) and one airy double aft cabin with access to bathroom and shower. 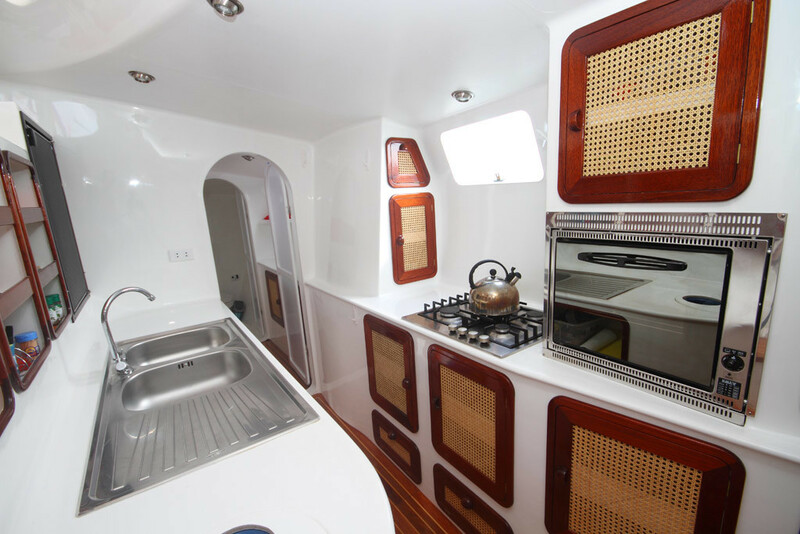 The cabins are very well ventilated with opening hatches and electric fans, and provide ample space to store your belongings. 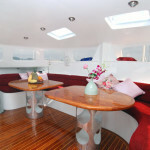 The salon with its comfortable settee is quite spacious and sits 8 people around 2 tables. 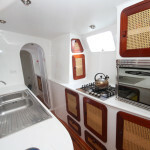 The well equipped galley is located in the starboard hull, featuring a 4 burner gas stove and an oven/grill. 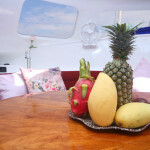 The crew compliment of the yacht is accommodated in their own cabins in the bows of the catamaran accessed by separate hatches. 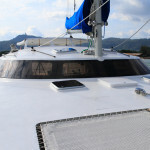 Above Decks Amadeus boasts huge shaded areas on deck. 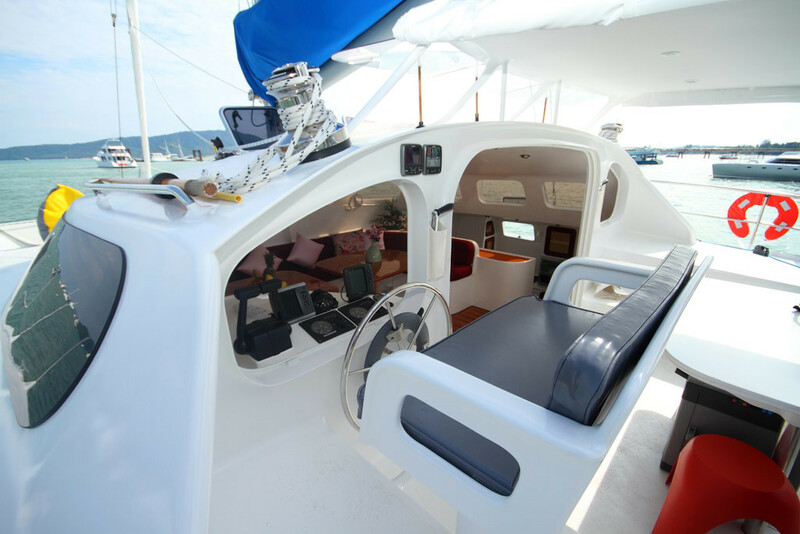 The cockpit has a solid fixed awning out of alloy, protecting you from the occasional shower and most importantly, from the sun. 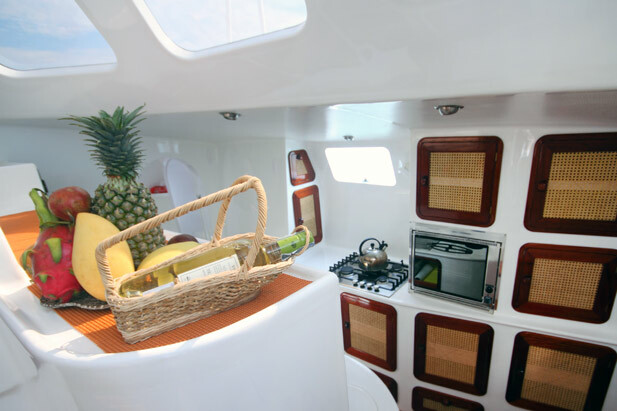 A flexible awning on the foredeck enables you to have your lunch served there, in the shade, taking in the panoramic view of the surroundings. 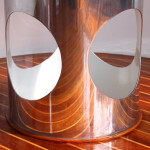 Quality hardware from Ronstan makes it a pleasure to take part in sailing the boat. 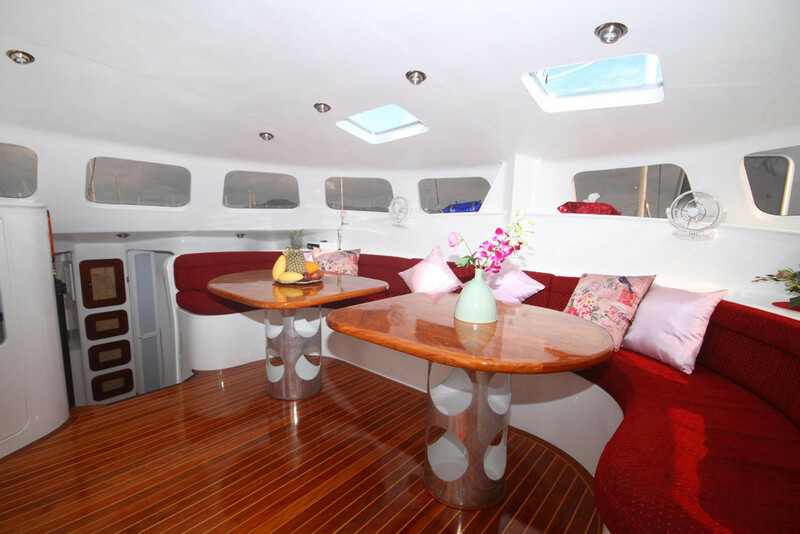 Wide walkways and the uncluttered deck makes it easy to move around and safe for children. 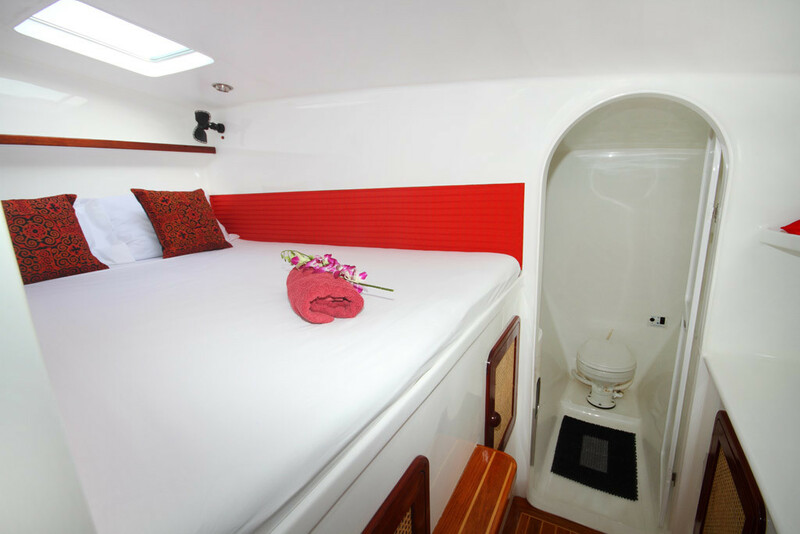 Two deck showers are located at the transom, close to the low swimming platform and ladder which allows easy access to the water. 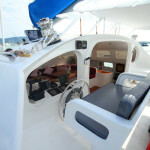 Standard: 8-person tender with outboard, snorkelling equipment. 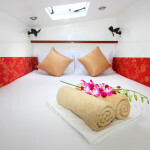 Extra: On-board Thai massage, scuba diving, two 2-person kayaks. 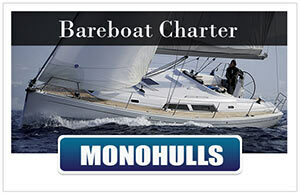 Sailing: Cruising speed 8 knots, top speeds 15 knots. 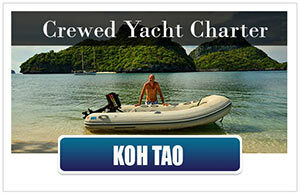 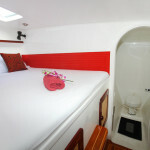 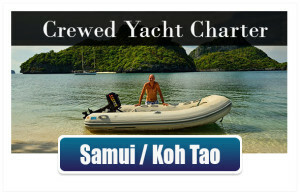 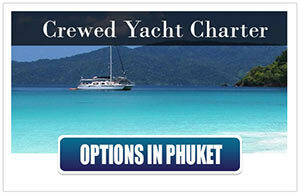 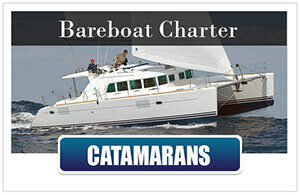 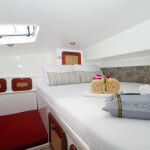 Special: Great charter yacht for a relaxing sailing holiday or just a day away from Phuket Island. 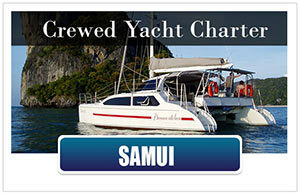 Excellent Thai and European cuisine on this yacht. 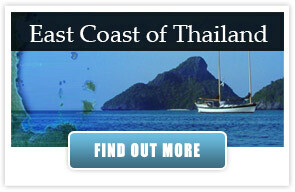 • For Burma: Burma entry fee & Visa fee. 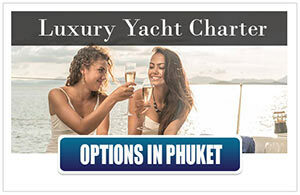 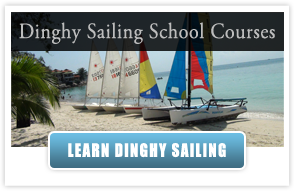 Live Aboard Thailand | Segeln Thailand | Sailing Courses | The Freedom Fargo| Sailing in Thailand| Adventure Sailing Cruises More Charter Yachts in Thailand are here: Charter a Yacht in Thailand. 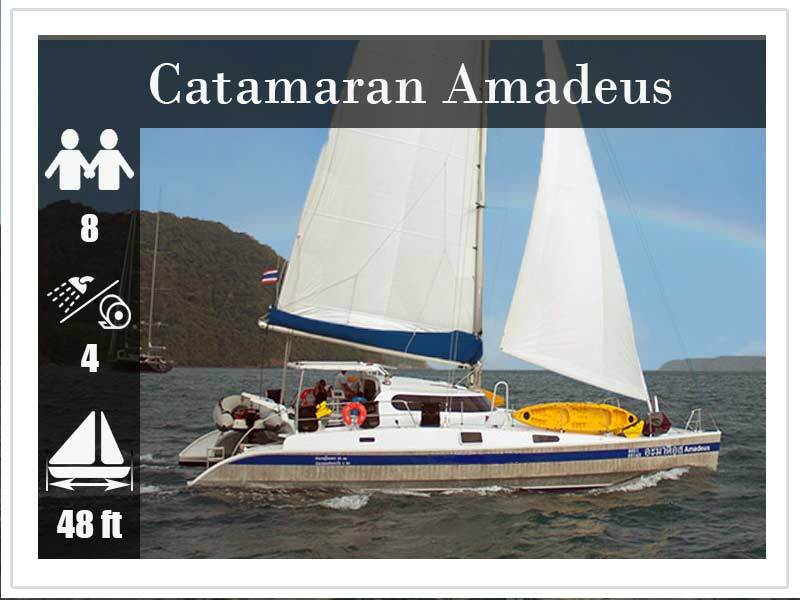 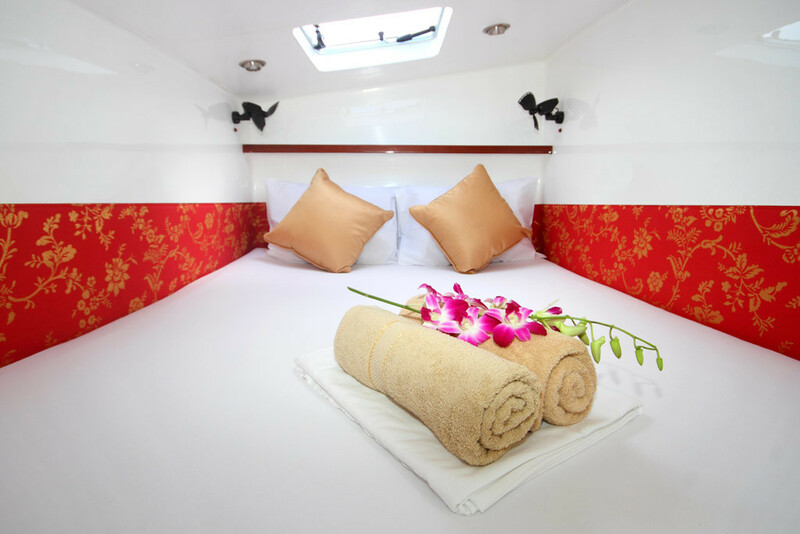 If you feel you need more details about the charter catamaran SY Amadeus or you maybe have an other question about yachting charter in Thailand, please don’t hesitate to contact the experts here.